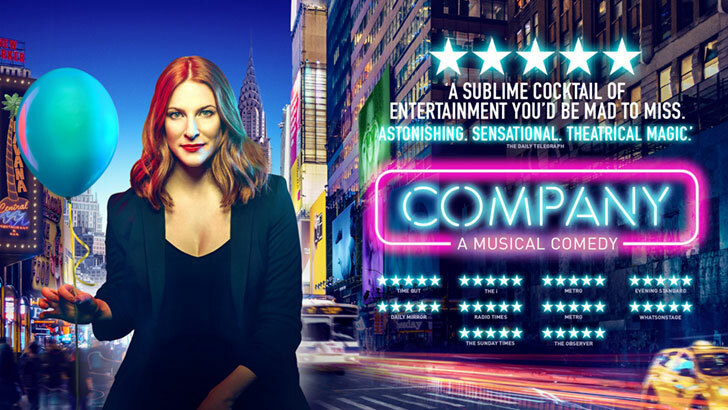 The complete cast has been announced for Marianne Elliott’s highly anticipated new production of George Furth and Stephen Sondheim’s COMPANY which opens at the Gielgud Theatre from 26th September 2018. Stephen Sondheim and Marianne Elliott have been working closely together on the script and have re-imagined these two characters as a gay couple for the very first time. Director Marianne Elliott said: "I could not be more thrilled that Stephen Sondheim agreed to turn Amy into Jamie. I hope it makes this production feel very, very now. We are keeping the existing dialogue, and not changing the famous scene in which the character gets cold feet about their impending marriage and sings the iconic "I’m not getting married today." The characters of Jamie and Paul feel like a lot of the contemporary gay male friends I know." Jonathan Bailey’s recent television work includes: Broadchurch, WIA, Chewing Gum and Doctor Who. His theatre credits include The York Realist, King Lear with Ian McKellen for the Chichester Festival Theatre , American Psycho at the Almeida and Othello at the National Theatre. His films credits include The Mercy, Christ the Lord, Testament of Youth and St Trinians. Alex Gaumond’s West End musical credits include Miss Trunchbull in the RSC’s Matilda, We Will Rock You, and Legally Blonde – The Musical. Other theatre credits include ENO’s Sweeney Todd with Emma Thompson, Taming of the Shrew at the Globe, Caroline, or Change at the Chichester Festival Theatre and A Christmas Carol at the Old Vic. His films include The Hustle and Hampstead. The complete cast for COMPANY is: Rosalie Craig as Bobbie, Patti LuPone as Joanne, Mel Giedroyc as Sarah, Jonathan Bailey as Jamie, George Blagden as PJ, Ashley Campbell as Peter, Richard Fleeshman as Andy, Alex Gaumond as Paul, Richard Henders as David, Ben Lewis as Larry, Daisy Maywood as Susan, Jennifer Saayeng as Jenny, Matthew Seadon-Young as Theo and Gavin Spokes as Harry. Joining them are: Michael Colbourne, Francesca Ellis, Ewan Gillies, Grand Neal and Jamie Pruden. Joining director Marianne Elliott on the creative team for COMPANY are: musical supervisor and conductor Joel Fram, choreographer Liam Steel, designer Bunny Christie, lighting designer Neil Austin, sound designer Ian Dickinson (for Autograph Sound), illusions designer Chris Fisher, orchestrator David Cullen, dance arranger Sam Davis and casting directors Alastair Coomer CDG and Charlotte Sutton CDG.